BOC has been around for quite a while, yet their music still sounds fresh. If you’ve never heard them before, perhaps you’ll recognize some of their sounds from Salad Fingers? 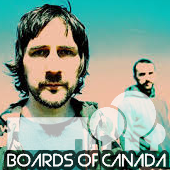 Boards of Canada (commonly abbreviated BoC) are a Scottishelectronic music duo consisting of brothers Michael Sandison (born 1 June 1970) and Marcus Eoin (born Marcus Eoin Sandison; 21 July 1971).